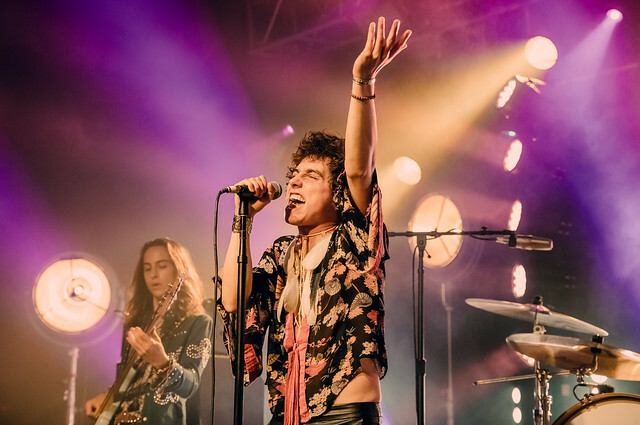 Greta Van Fleet Prove That Rock N’ Roll Isn’t Dead At Sold Out New Jersey Show Reviewed by David Zeck on May 14, 2018 . It’s not easy to find a talented, up-and-coming band who takes you on a ride to the good ol’ days of rock n’ roll, and especially one that does it really well. With that said, unless you’ve been living under a rock or sheltered in an underground bunker, you’ve probably heard of this band. They’ve been making it a habit of leaving audiences across the world in awe and have become one of the most talked about acts of 2017-2018. Allow me to introduce the band that’s leading the new rock n’ roll revival, Greta Van Fleet. 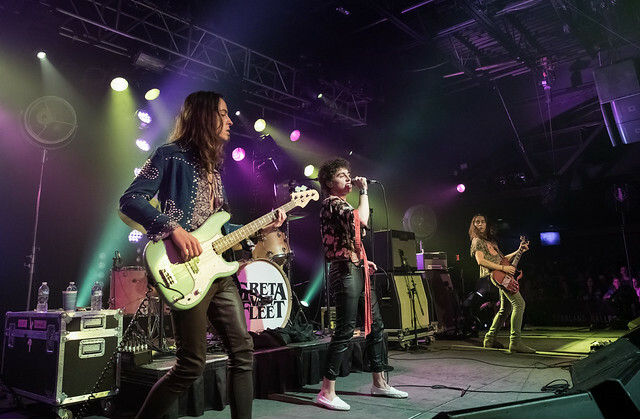 Greta Van Fleet’s debut single “Highway Tune” maintained the number 1 position for five straight weeks on the Billboard Rock charts, and set a record at Canadian rock radio with nine weeks at number one. 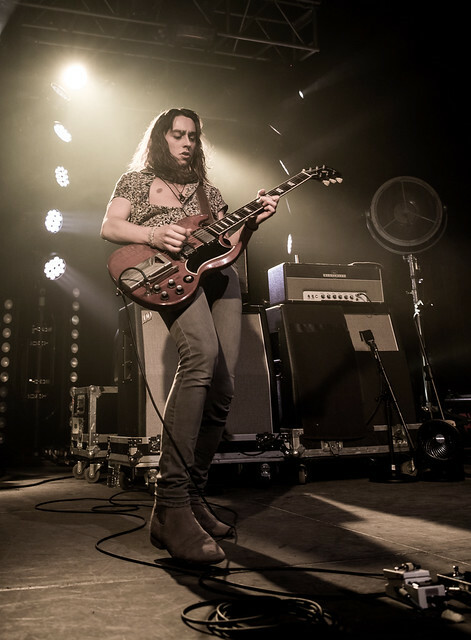 The band consists of four young musicians, brother’s Josh (vocals), Jake (guitars), and Sam Kiszka (bass/keyboards), plus (drummer) Danny Wagner, and has been touring the world and appearing on every major festival you could think of all while winning over music lovers around the globe. On November 10th, 2017 the band released its double EP titled From The Fires, which combined four new songs with four tracks from Black Smoke Rises. Greta Van Fleet is set to release their debut full length this year but for now you can picked up the EP HERE to hold you over! The group also has a history because of these EP’s, of playing only sold out headliner dates and now in 2018 that hasn’t changed. 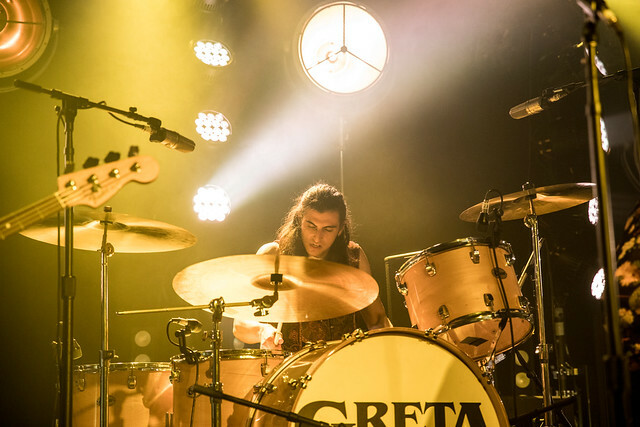 Greta is arguably one of the hottest tickets around, an almost all of there scheduled headlining shows for the year are long sold out. When I heard the band would be touring this Spring, I immediately jumped at the opportunity to cover these guys. I had the pleasure of see them once prior at Rock Allegiance in Camden, NJ last year and was left completely speechless by how good they were. So I made my way to New Jersey’s Starland Ballroom for yet another sold out GVF show. I was really pleasantly surprised to hear support for the night would come from another insanely talented rocker the badass Dorothy. Dorothy is the Los Angeles-based alternative, bluesy flavored rock band led by singer Dorothy Martin who is known for her rock regalia, messy hair, and leather boots. The singer/songwriter has worked hard with the legendary Linda Perry, creating her own rock n’ roll masterpiece. Her second full length album 28 Days In The Valley was produced, engineered, and features song’s co-written by Perry and was released on March 9th by Jay-Z’s label Roc Nation. That’s not to say things have been easy for the Budapest-born and San Diego raised musician Perry doesn’t put her name on just anything and Dorothy found herself in a very humbling and eye opening experience. 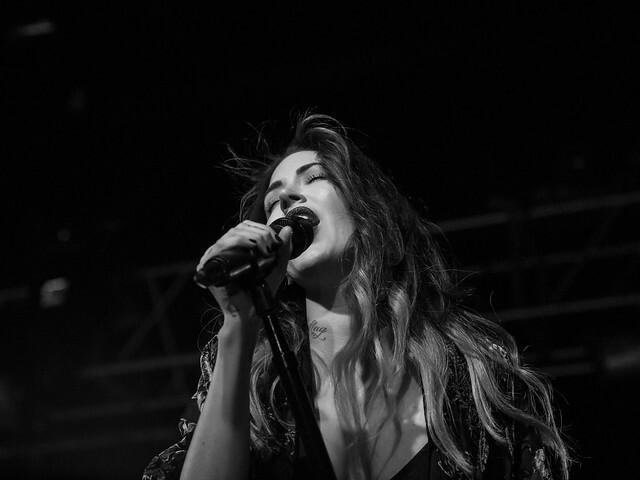 The band’s debut album ROCKISDEAD was critically acclaimed and even put here on the radar of Rolling Stone who named her one of the best 50 new artist. It also landed them at Number 1 on the Billboard Heatseekers charts. Now we get to watch and see where her latest release takes her; if I had to bet I would say to new heights. It was a beautiful Friday night in New Jersey for some live rock n’ roll at one of my favorite NJ venues. 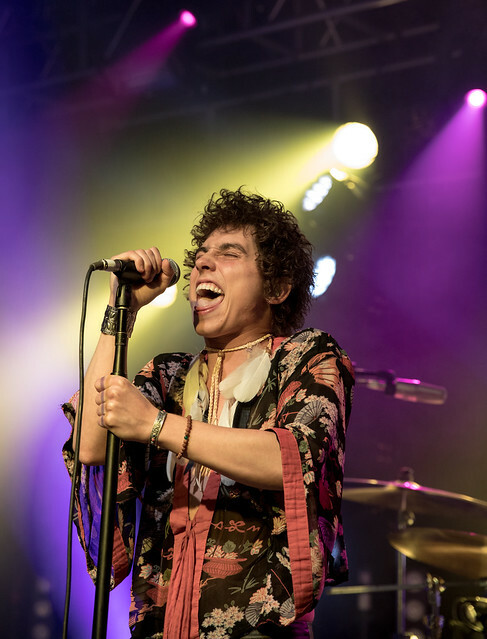 Starland Ballroom has seen many legends take the stage and now it was Greta Van Fleet’s turn to leave their mark. I arrived to the venue where there were insane lines and cars in the parking lot blasting Greta’s music. I made my way into the venue holding a very diverse and friendly crowd, kids as young as 15-16 years old to a 70 year old couple all came out to see this show. At 8pm the show began and Dorothy took the stage, as she went up to the mic and took in the crowd’s excitement. The group began with “White Butterfly” from 28 Days in the Valley. Dorothy Martin hit her notes flawlessly as she walked and danced barefoot around stage, taking in the atmosphere and energy of the crowd. She makes it look easy and natural; Martin isn’t trying, she’s just doing what she knows and loves, and the fans give it right back. The stage was engulfed in incense and the New Jersey crowd rocked away with zero hesitation. 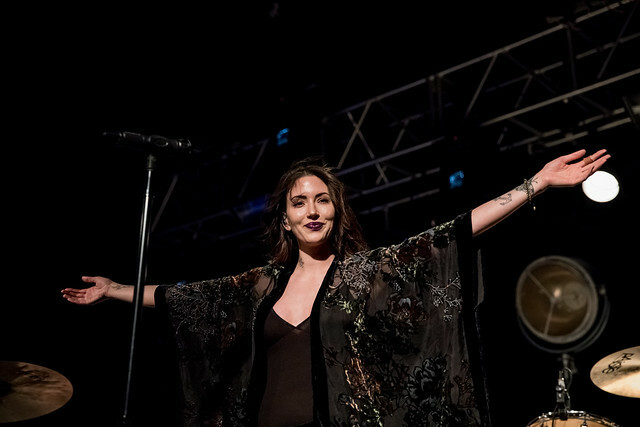 Martin’s ability to interact with the fans is a talent in itself – she’s not running through the motions but rather connecting with individuals she spots in the crowd. The band would go on to play “Pretty When You’re High”, “Who Do You Love”, and “Down to the Bottom” throughout the 45 minute set. Dorothy’s unique yet comforting voice echoes in the ballroom. Live her voice is just as raw and beautiful as it is on CD; the songs literally make you think and reminisce while she’s singing. Now although the band is named after the vocalist that’s not to say there isn’t some serious musical talent in the band. 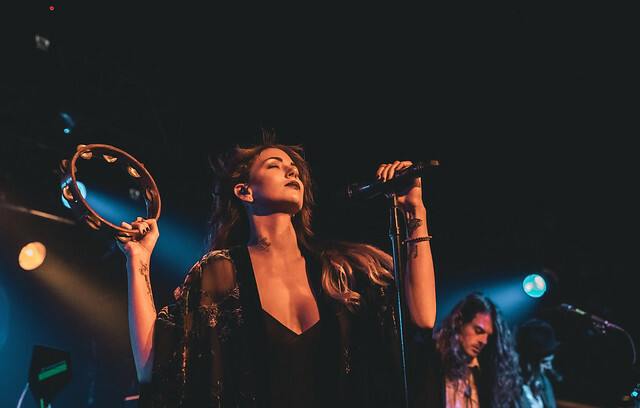 The band, which consists of Eliot Lorango, Eli Wulfmeier, Jason Ganberg, and Nick Maybury, are perfection live and execute the songs perfectly and keeps the movement going as she can’t do it all by herself – it’s a team effort. By the time the set was up, the crowd was in a state of awe, some maybe even forgetting for a brief moment that GVF was next. One thing I know for sure, I’ll be paying attention to what’s next from Dorothy and I think you should too. Next up it was time for Greta Van Fleet to hit the stage. The boys came on around 9:30 and fans on the barricade were beyond excited to see their boys. By this point Starland was packed, front to back and side to side. We were like sardines in a can and it was worth every minute. 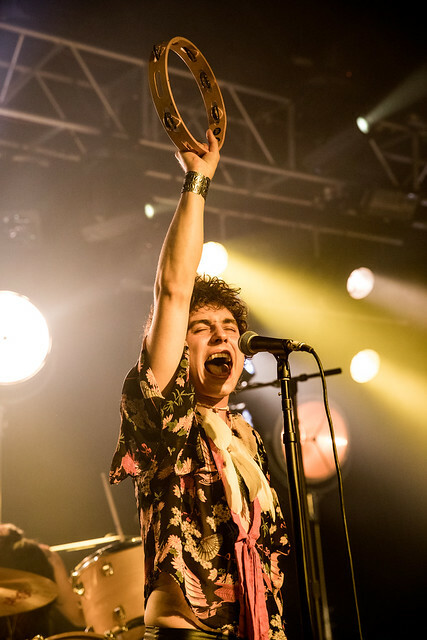 As Greta Van Fleet made their way on stage and the fans screamed with excitement, singer Josh Kiszka came out with flowers in hand and threw them towards the ladies in the crowd and made sure to hand them to some lucky fans in the front row. The band opened up with their highly successful track “Highway Tune”, which kicked things into high gear and set the tone for the rest of the night. The stage more lighting than I’ve ever seen GVF have and even some fog to add to the vibe. The fans were almost constantly screaming; it was loud like Backstreet Boy concert loud, not that I know what that sounds like or anything. It’s important I state right off the bat these guys are so damn talented; the musicianship is insane! There are moments during the set where you think you know the song and you probably do but GVF take it to a whole new level when performing the songs live. 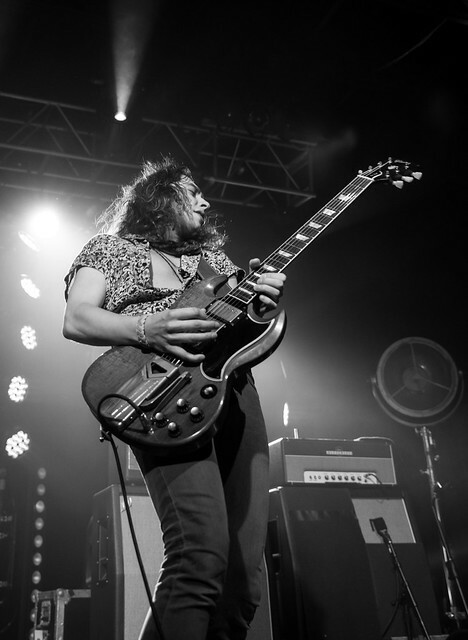 Guitarist Jake Kiszka shreds his guitar like a player of twenty plus years at one point throwing the guitar behind his back and shredding with ease. 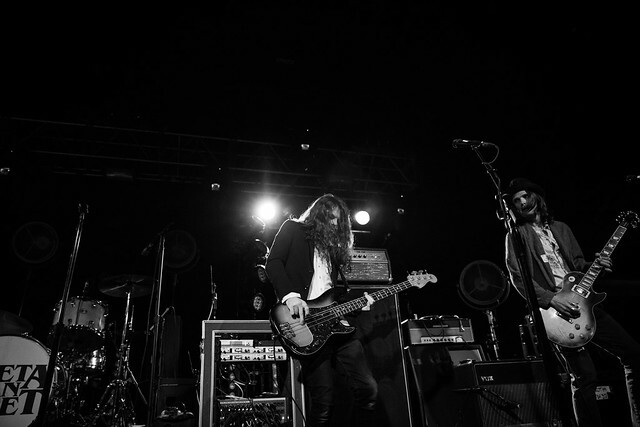 Brother Sam doesn’t let Jake do all the showing off as he plays his bass like nobody’s business. I refuse to call Greta a throwback or to even compare them to others. Yes, they have that post-Woodstock sound reminiscent of Led Zeppelin or Aerosmith but it’s important to remember these boys are basically kids. Greta is a band of three brothers and a childhood best friend with the oldest being 22 years old and two of the members aren’t even twenty. The band’s set is about 12 songs and consist of fan favorites “When The Cold Wind Blows”, “Flower Power” and the closing song during the encore “Safari Song”. The group also pulls out a cover of “Evil” by Howlin Wolf. When the show ended, fans displayed every adjective that could be used to describe satisfaction, full smiles walking out of the venue. Their time and money was clearly well spent. I loved and respected these guy’s after hearing the song’s on their EP and I saw them live several months ago, but man was I completely blown away by how much better they get every time. These boys are carrying the torch of true raw rock n’ roll and I really believe they will be responsible for inspiring a whole new generation of musicians. The future is bright for Greta Van Fleet and I’m honored I’ll be able to say I saw it from the beginning. If you’re looking to experience a truly raw, authentic, and entertaining rock show these guy’s deliver. They don’t use lasers or screens or any theatrics, what you see is what you get four musicians, a stage, a crowd, and their instruments and it’s damn fun to watch. Greta isn’t going anywhere anytime soon the tour rolls on and wraps up on May 25th in Detroit for the band’s homecoming show, they will then be heading over to Europe before returning to the states to play gigs through October. Check out the tour dates below and checkout their website HERE for more info! See full gallery of the night. A weekend at Carolina Rebellion with S16: Day 3!